The Defenders, that very much-anticipated super hero team up, has finally arrived at Netflix, and with just 8 episodes of story to relate, it is by far the easiest of the Marvel TV shows to binge-watch (which we recommend doing as soon as possible in order to avoid the splurge of spoilers that will inevitably be making their way online this week). With only 8 episodes, The Defenders doesn’t seem like it has time to dawdle, and yet, it takes its time. The first couple of hours are pretty slow, focusing on reintroducing our favorite characters and reminding us where each of them stands mentally, emotionally, and physically after the events of their separate solo seasons. Matt Murdock has hung up the mantle of Daredevil in favor of being just a lawyer. Jessica Jones hasn’t taken on any new clients since her showdown with Kilgrave. Luke Cage has been released from prison and reunited with Claire, and Danny Rand — the Iron Fist — and Colleen Wing are hunting The Hand in Cambodia. While it’s important to note that missing out on the first seasons of either Luke Cage or Jessica Jones probably won’t drastically impinge on your enjoyment of the series, a deeper knowledge of Daredevil (particularly season 2) and Iron Fist are required viewing, and that is largely because the main villain of The Defenders is ubiquitous Hand. The Hand, for those not in the know, is a villainous organization first introduced in Daredevil and then expounded upon in Iron Fist. But it’s only in The Defenders that we are introduced to the true leader of the Hand, Alexandra, played by Sigourney Weaver. By the end of Daredevil’s second season the Hand had acquired Elektra’s dead body to be used for some unknown purpose. It quickly becomes apparent that the Hand has since raised Elektra from the dead. However, she is no longer quite the same. In fact, Elektra is ‘gone’ and all that is left is a weapon the Hand calls “Black Sky.” What does the Hand want? Immortality. And they need the Immortal Iron Fist to get it. 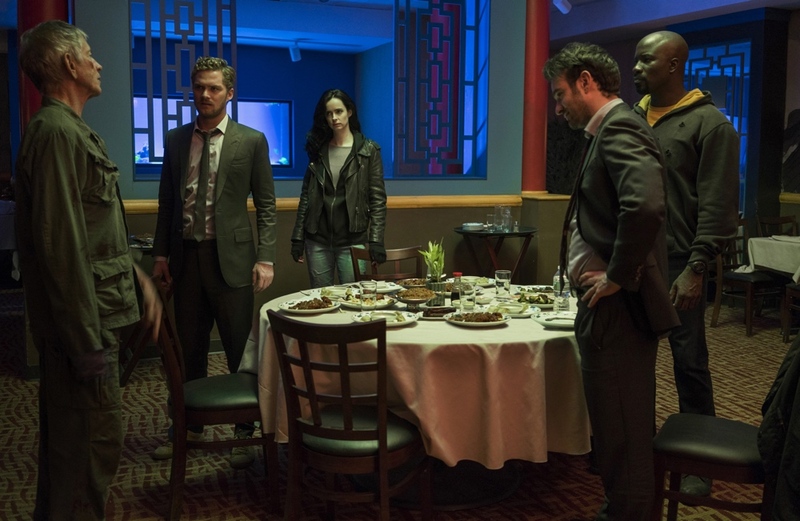 Each of the Defenders is on his or her own separate journey, but eventually those paths collide as they figure out they are all fighting the same villain. But these are four very different people who don’t particularly relish the idea of working as a team. It takes a lot of time for them to learn to trust each other, and we don’t see them fighting together as an effective unit until the end of the third episode, and that team up is largely accidental. Building trust between these characters is no easy task. Throughout the season we see them come together only to break apart and come back together until the situation becomes dire enough to force those tentative bonds to stick. It’s not until the final episode that we really get to see these four characters come together as an unstoppable fighting team and it is that much sweeter because of the build up. Where the show really finds its voice is in its interactions between the various well known and well loved characters. From Jessica sassing Matt and Luke’s skepticism of Danny, to Trish Walker connecting with Karen Paige and Misty Knight risking her life for Colleen and Claire. Of course I wanted Matt and Jessica to meet, but these minor character connections were the moments I never knew I needed in The Defenders. That’s a big part of the appeal, actually — It’s their love for the city and its people that really connects these characters and binds them together — once they get all their aforementioned trust issues out of the way. Overall The Defenders delivers on the epic fight scenes promised as well as surprising emotional connections drawn between a range of characters with very different backgrounds and personalities. The finale packs a big punch with a shocking twist you won’t see coming. It’ll be interesting to see where these characters go on their individual journeys as a result of this adventure. Next up on Netflix’s Marvel slate is The Punisher’s debut. Season one is set to premiere later this year, followed by Daredevil season 3 and Jessica Jones season 2, both of which will hit screens in 2018.